The African Studies Thesaurus contains 5457 descriptors and 7531 non-descriptors. Descriptors, or preferred terms, are used to describe or index a publication. Like tags or labels in social media they are there to help you find things. While tags are free and personal, descriptors are part of a controlled vocabulary, the thesaurus, which ensures that the same tag will consistently be used to label the same thing. 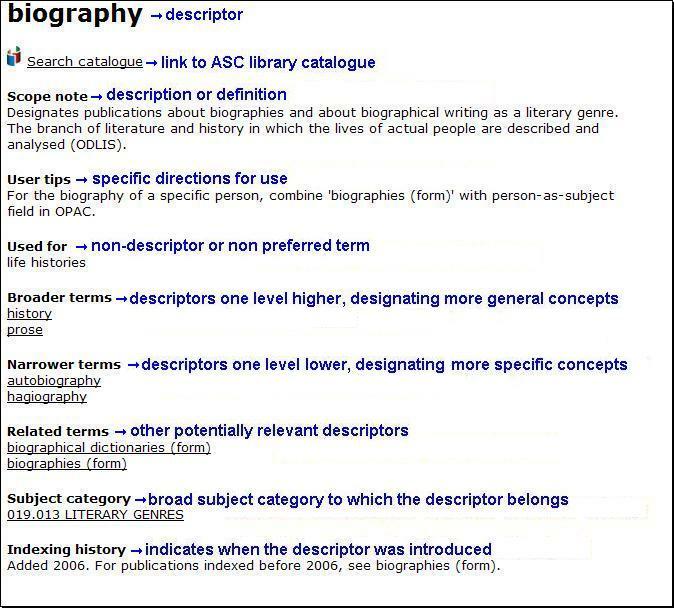 Descriptors can be used to search the library catalogue for all documents, irrespective of language. Non-descriptors, or non-preferred terms, are (quasi-)synonyms, variant names or alternative spellings of descriptors. Non-descriptors direct the user to the descriptor, the preferred term for the concept in question. The use of descriptors ensures that the same term is consistently used when referring to a particular concept. For example the West African ethnic group variously known as the Fulani, Foulbe, Fulbe, Haalpular or Peul, amongst others, is always represented by the term Fulani, and the other terms by which this ethnic group is also known all lead to this term. Sometimes a descriptor embodies several related concepts. For example, the descriptor ritual objects is also used for amulets, fetishes, talismans. In the thesaurus, all these terms direct the user to the descriptor ritual objects. Typing a word or several letters in the search field and clicking the 'search thesaurus' button produces a list of all terms starting with or containing that word or those letters depending on which option - 'starts with' or 'contains' - has been checked. If a term is not found, the alphabetically closest terms are displayed. Clicking on a letter in the A-Z list produces an alphabetical list of all terms beginning with that letter. In the alphabetical indexes, descriptors are in regular font, non-descriptors in italics. The list may span more than one page. Clicking on subject categories produces a list of all subject categories, and clicking on a specific category produces a list of descriptors belonging to that category. The thesaurus includes a number of broad geographical and form headings which can be used to obtain a list of descriptors per country, material type or genre. * geographical headings, e.g. Algerian languages, Ghanaian peoples, Cameroonian polities, Kenyan political parties, can be used to generate a list of languages, peoples, polities or political parties in a particular country. * the descriptor documents (form) groups all material types; clicking on a specific material type produces a corresponding list. * the descriptor literature (form) groups literary genres; clicking on a specific genre produces a corresponding list. * the descriptor time periods groups all the time periods.